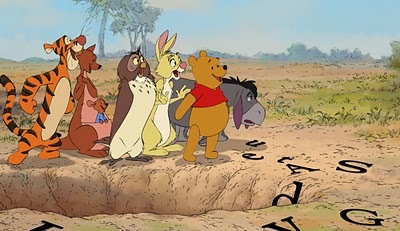 The Disney Studios put out a wonderful piece of nostalgia and innocence back in 1977 called ‘The Many Adventures of Winnie-the-Pooh’ which was a collection of various stories involving the lovable characters of the Hundred Acre Woods. Later in the 90s, Pooh et al. were shoved into numerous straight to DVD movies that existed merely for merchandising amongst toddlers. Now in 2011, Disney tries to bring these timeless characters back to their Disney-fied roots. For the most part, they managed to deliver a simple movie that appeals to both young toddlers and fans of the original. In my opinion, it still tends to lean more towards the young ones. For one, the film is a mere 1 hour long. Yes, I know the original was an hour and 15 minutes, but that makes all the difference in the world. Especially since you can only see this 2011 movie in theaters which means you are forking up about $10 for an hour. The studio chose to do this because they knew the movie was simple and aimed at very young toddlers, so you don’t want the families squirming through a long movie. The biggest point I have for why this movie does not stack up to the original, is that there are no sweet emotional moments. Even the TV-Christmas special had more emotion. This movie just focused on being cute and for the kids. However, these are only slight accusations. Pooh 2011 incorporates much of the same styles as the original did artistically. These small touches include but are not limited to: a few fantastic hallucinatory sequences, seeing the pencil markings from the artists (in Tigger’s stripes, or Pooh’s eyebrows), the impressionistic sketched out backgrounds, clever meta-moments were the characters interact with the narrator and the physical story book, innumerable 15 second silly songs and the fact that everything about it is very simple. Even though the voices may be a little off (namely Piglet and Rabbit) the character motivations are spot on. In fact, there are 2 improvements on the characters: there is no Gopher and Owl is actually a fun character. Summary: Perhaps I have become too jaded or that I grew up watching the 1977 one ad nauseum on VHS, but I just prefer the original. This one lacks some emotion that would have given the film a purpose. Then again, it is aimed at children much younger than myself. I would recommend this to any young families or fans who just want to return to the Hundred Acre Woods with their favourite characters, but you should probably wait until it comes out on DVD since the length does not justify theater prices. Pooh 2011 lands at #643 of the 1573 movies of I've seen [on flickchart.com].